This week on Bitten By The Bug 2 we are doing something a little different. 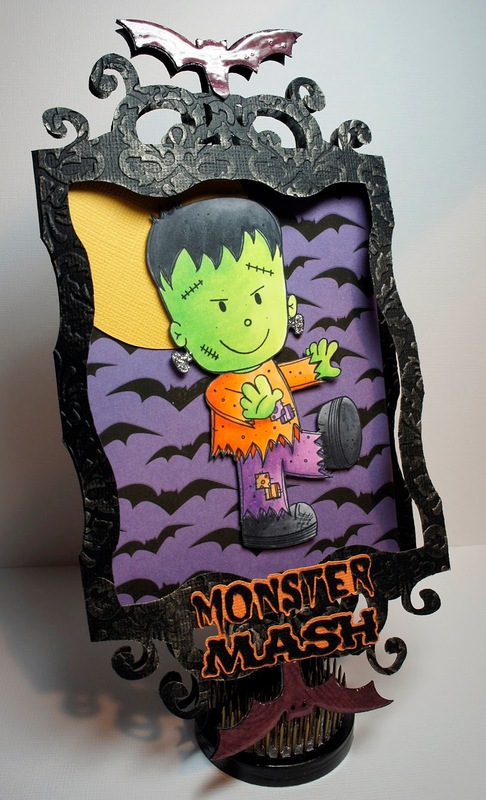 The Stamping Boutique is sponsoring our challenge this week and we are doing a Halloween theme. We were asked to pick one of The Stamping Boutique's Halloween/Fall themed digital stamps and use it along with one of the Halloween frames on Happy Haunting's (our Leader Heather's choice). I couldn't wait to do this project--Copics, Digi Stamps and Cricut together = FUN! 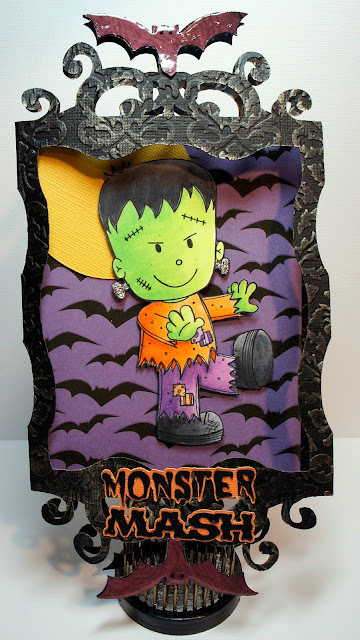 I chose the Frankenstein Digital Image and paired it along with a frame from Happy Hauntings. I think I probably have used this cartridge more than any other in my collection and still love it every time! Remember to go back to Bitten By The Bug 2 and check out what images and frames my other teammates picked and then play along in the challenge with us! I welded the frame together on my Gypsy to make the card base and then ran it through the Cuttlebug with the Kassie's Brocade Cuttlebug Folder. I then rubbed some chalk ink in Pewter over it to give it a "old" look. Glossy Accents were added to the bats. 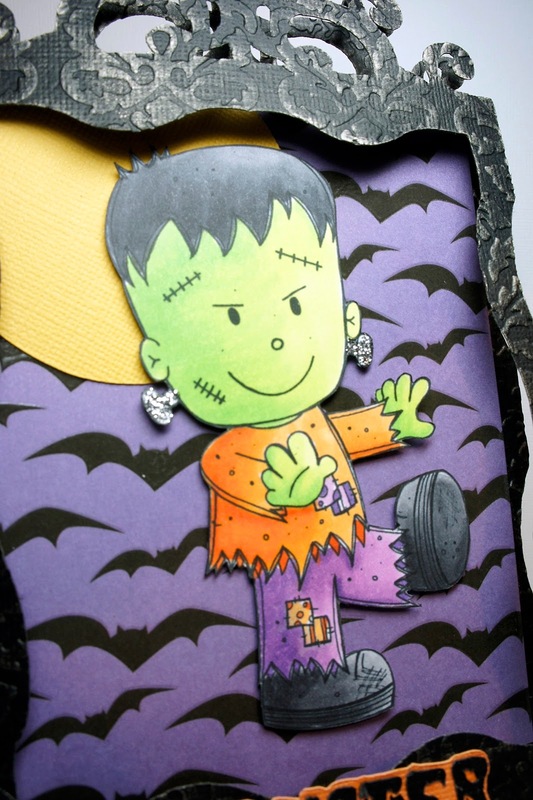 Frankenstein was colored with Copics and then hand cut out. Happy Hauntings = Monster Mash @ .75" and the frame welded together @ 7.0"
George and Basic Shapes = Circle @ 2.41"
This is awesome! I love all the detail! Great job! This is TERRIFIC Maria!! I love what you did with the frame, and the detail with the chalk & glossy accents!!! Wow! This has to be the CUTEST card EVER!! (in a Spooky kind of way, of course! :) Love it! OMGoodness Maria.......I LOVE LOVE LOVE your card! It is so stickin cute! I'm a BIG fan!!! Super fun and spooky! Love the bats~! 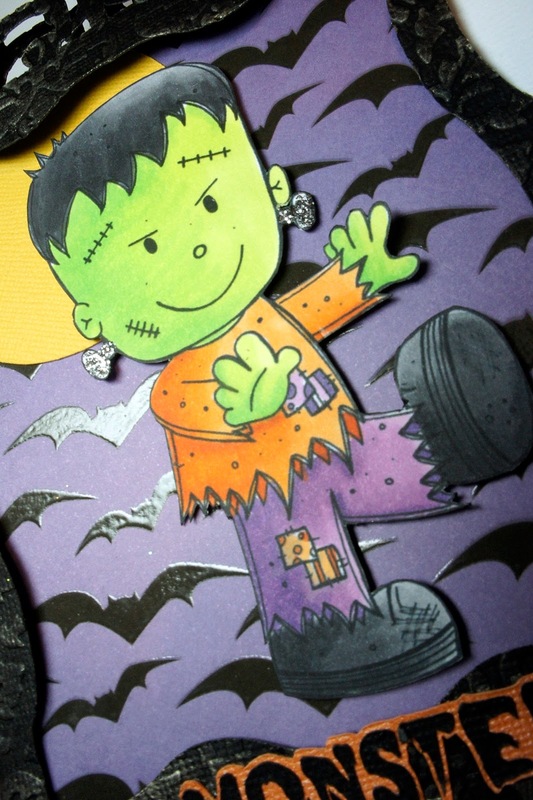 Love what you did this this little Frankie image. That background paper is just perfect. This is so so cute! He isn't the least bit scary! OMGosh Maria you sure made Frank pretty good lookin, actually he's too stickin Cute! Love the background papers, perfect for this! I love what everyone did with these stamps, so much FUN! WOW! I love the embossing on the frame and the metallic chalk. This is just incredible, Maria! WOW!! Είναι πολύ ωραίο! I just love how you colored the little Frankie with Copics! You are super talented!! I am learning and would love to take a class on Copics. i have to ask you too if you ever sell this beauty, i will bid first, ok?